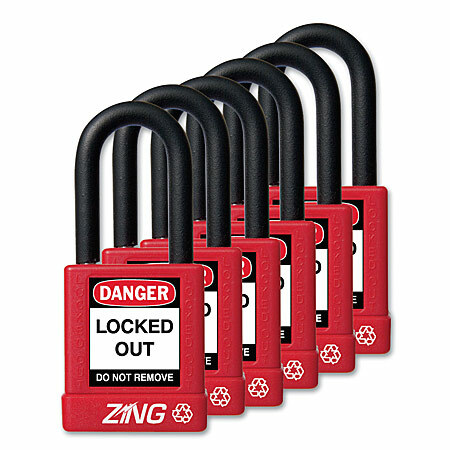 Edible Lockout Locks … Environmentally Friendly? Two Lab­Safe­ty posts in a row? I just had to con­tin­ue here. We’re going to be talk­ing about green locks that are red. Real­ly. Accord­ing to the descrip­tion, these lock­out locks are green because a) they con­tain no PVC and b) because the lubri­cant is edi­ble. Since the locks are plas­tic of some sort, I’m not sure I buy the “no PVC” thing as being good — be clear that these locks aren’t to pre­vent theft — they’re to make you think before doing what­ev­er they’re try­ing to stop you from doing — so the plas­tic is “OK” … but I sup­pose the rel­a­tive “good­ness” of var­i­ous plas­tics is edi­ble. Just how much lock lube is being poured into our envi­ron­ment any­ways? I sup­pose it’s “nice” that they think they’re try­ing. This entry was posted in fail, Lab Safety and tagged edible lube, labsafety, lock, lockout, locks, lube. Bookmark the permalink.